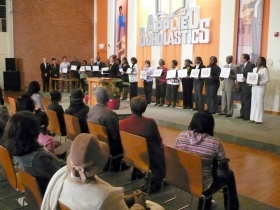 Applied Scholastics offers programs to equip educators with a mastery of the applications that allow students to become more accountable, self-directed and self-advocating. Teachers or educators who wish to implement Study Technology in their classrooms are given commanding tools and teaching techniques that help them create an optimum knowledge base and learning environment for their students. Beginning, intermediate and advanced packages may be tailored to individual needs, time frame, educational setting and scholastic needs. Training at Applied Scholastics International or at Applied Scholastics centers is open-entry and open-exit. The Educator Training Program is composed of several separate training sequences that cover the fundamentals of Study Technology, communication skills and practical skills needed to conduct self-paced learning. This course provides an in-depth understanding of the technology of study to make the learning and teaching of any subject more efficient and effective and to ensure that students can apply what they learn. Counts as two Continuing Education Credits through California State University, Hayward, at additional cost. Building on the foundation of Study Tools for Educators, this course emphasizes advanced tools to improve comprehension and includes special techniques for word-defining to assist new readers and semiliterates. Every educator needs these vital tools in the formulas and successful practices of communication. Learn to present information in a way that increases understanding and obtains cooperation and engagement, resulting in effective classroom management. Counts as four Continuing Education Credits through California State University, Hayward, at additional cost. This is a breakthrough method of running a classroom that allows for more individualized instruction to help students progress via learning barriers assessment and remedies. Ensures that students can use what they learn. Counts as six Continuing Education Credits through California State University, Hayward, at additional cost. The Advanced Training Program includes a more comprehensive understanding of the methodology of Study Technology and its application and awards a permanent certificate. Learn the barriers to study and how to identify, overcome and ultimately prevent their occurrence. Many exercises are included to develop the skills needed to improve the ability to study and to learn any subject. An ability to evaluate incoming information and to isolate key factors of comprehension, concept and relevance are important components of this course. Includes a series of twelve recorded lectures by L. Ron Hubbard on how to study and learn and on education in general. Trainees learn to help others overcome their study difficulties. Learn specialized techniques to enhance the teacher’s ability to overcome communication challenges and to communicate meaningfully in any environment. Learn special techniques to ensure cooperation, to command the attention of others and to ensure understanding within any classroom. Acquire more advanced techniques and assessment tools to identify the barriers to learning and apply appropriate remedies for slow and struggling students. Learn to develop and maintain strong student interest ensuring progress and application of academics. This course brings the educator’s skills to a professional level. Services available at Applied Scholastics International range from workshops, conventions and courses on basics to advanced teaching strategies and methodologies. Programs combining a number of courses and including apprenticeships are offered. The international training center at Applied Scholastics fully embraces a hands-on, interactive learning environment. You will have the opportunity to put the skills you learn into action in the classroom by working with local youth under the supervision of an experienced Study Technology practitioner. The entire experience at Applied Scholastics International is geared toward enhancing and supporting your teaching abilities and skills to enable you to reach your goals of increasing your effectiveness as a professional.